2180.01.30 2nd Fleet arrives at Gorg, and surrounds the Phaerax fleet. Olympia demands that the Phaerax lift their blockade. Naturally, they refuse. Olympia issues a declaration of war. The battle is short. 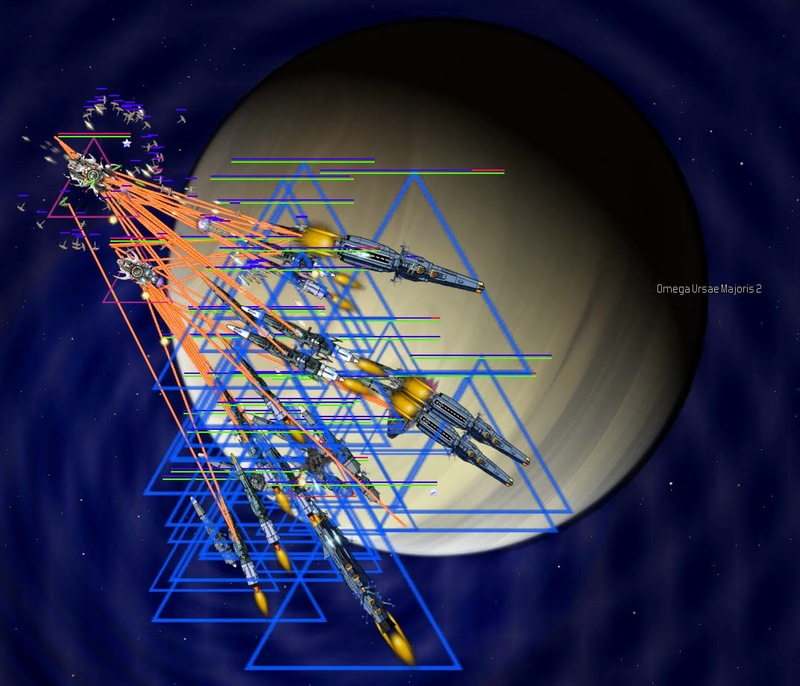 Many of the Phaerax ships leave orbit and go after the nearby gas mining station. 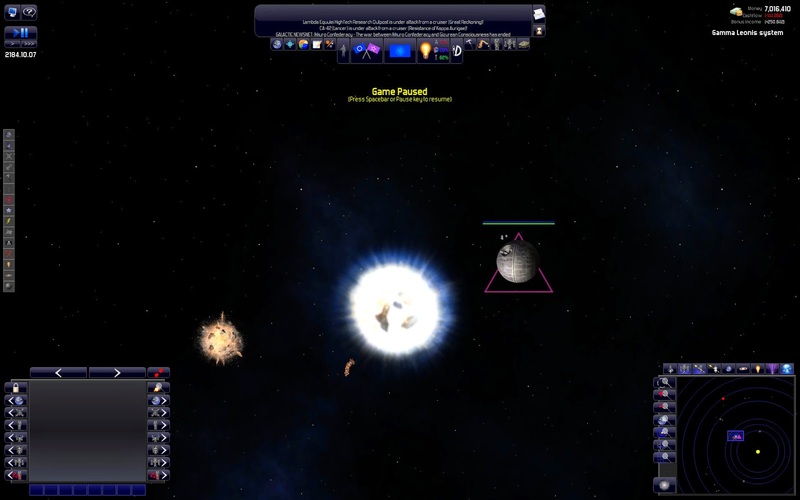 Other Phaerax ships are destroyed, and the Gorg Spaceport goes down. No Olympian vessels are destroyed in the first clash. The Phaerax 44th Fleet flees the Gorg system. 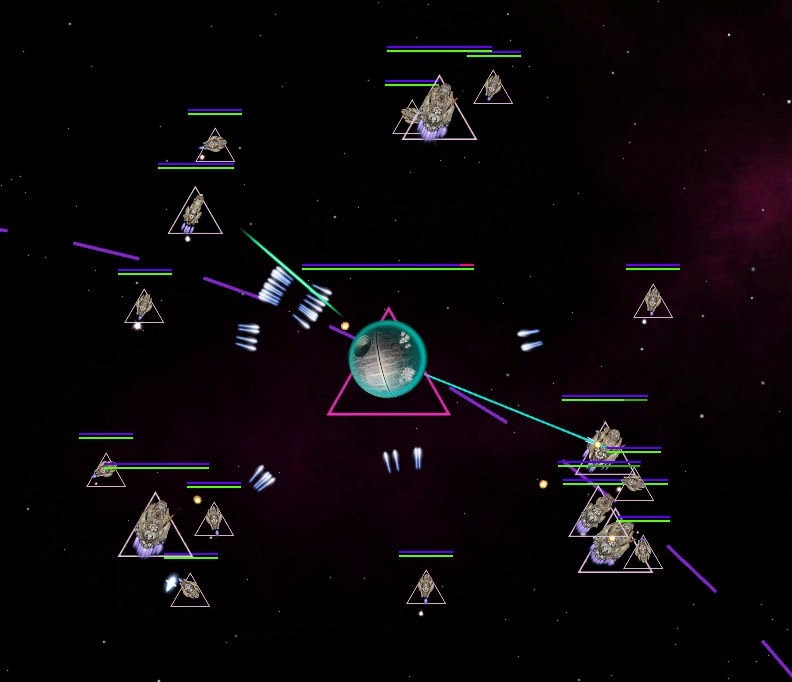 2180.05.14 The Olympian 12th Fleet attacks the Phaerax world of Xi Orionis 2, and the 5th Fleet loads troops and invades the planet. Xi Orionis 2 falls quickly. 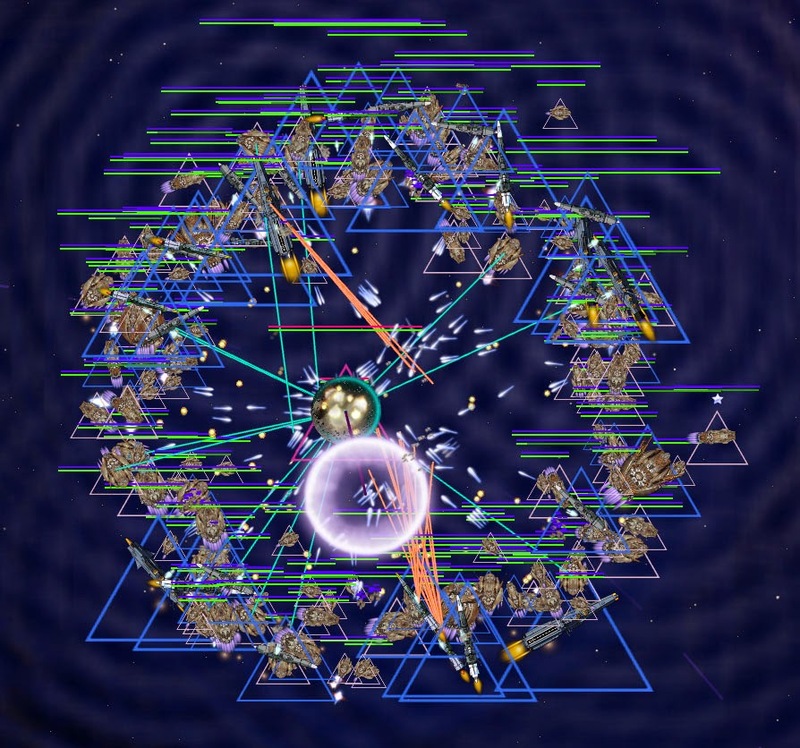 With the blockade removed from Gorg, and Xi Orionis 2 captured, the objectives of this war have been fulfilled. 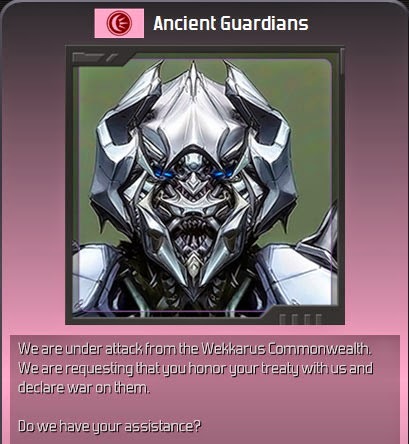 The diplomats ask the Phaerax if they are ready for peace. Phaerax reject the proposal. 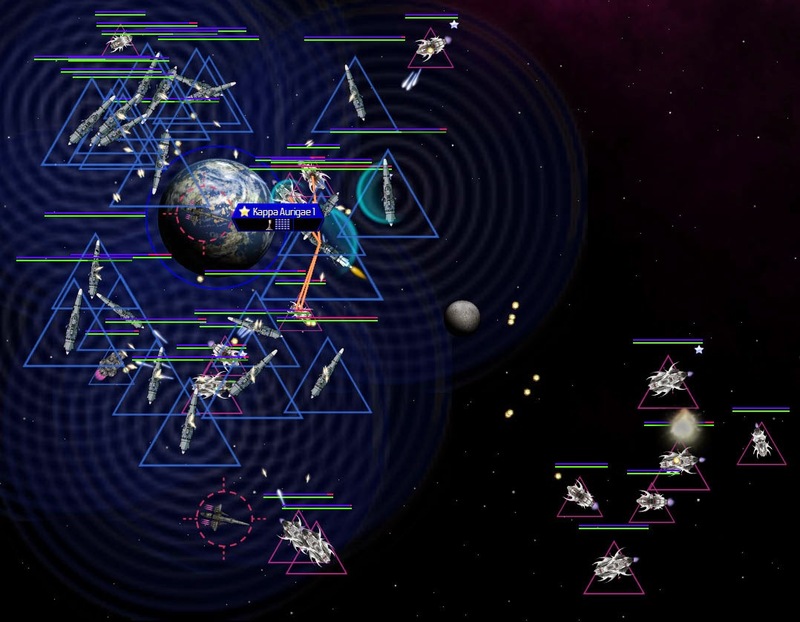 A Phaerax fleet, the 50th Strike Force, is detected inbound for Xi Orionis 2. 2nd Fleet is dispatched to reinforce 12th Fleet there. 2180.08.26 The Phaerax sue for peace. 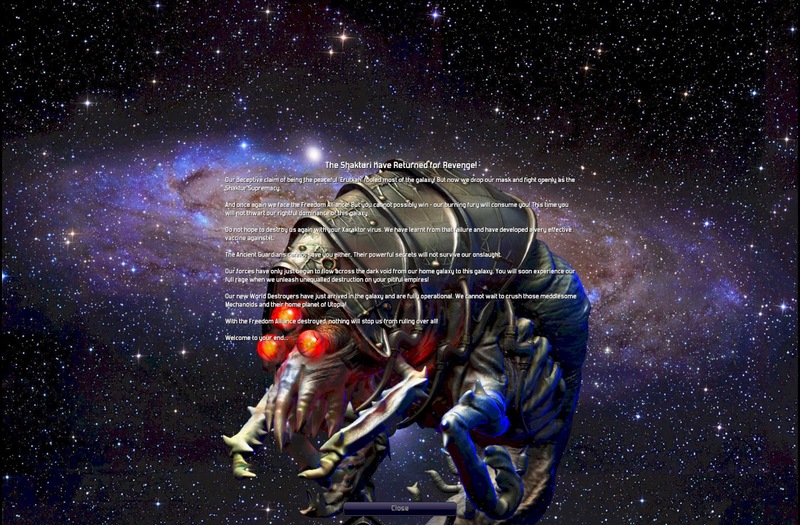 Their 50th Strike Force is closing in on Xi Orionis 2, and it is speculated that they detected the overwhelming Olympian force in the system, and that their cause was hopeless. Olympia agrees to the peace. 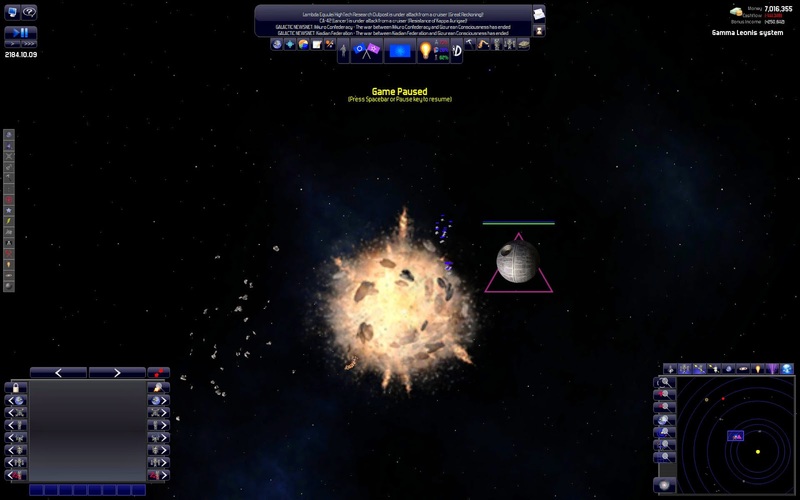 2180.11.23 The situation of the Kiadian Federation continues to deteriorate. The Kiadians have not asked for help, and the Eruktah continue to pound them. Their military strength continues to climb. President Bendasian fights against the Senate’s reluctance to get involved, and finally convinces them to provide monetary aid to the Kiadians. The President hopes the some form of military aid will soon follow. A gift of 192,570 credits is delivered to the Kiadians. In the five years of its existence, and with a mere three colonies, the Eruktah Refugees have a higher GDP than the Olympian Way. This gets the attention of the Senate. The data are irrefutable. Immediately the Senate orders 2nd Fleet, consisting of some of Olympia’s oldest ships, to the Kappa Aurigae system to provide aid.. President Bendasian hopes it’s not too late. 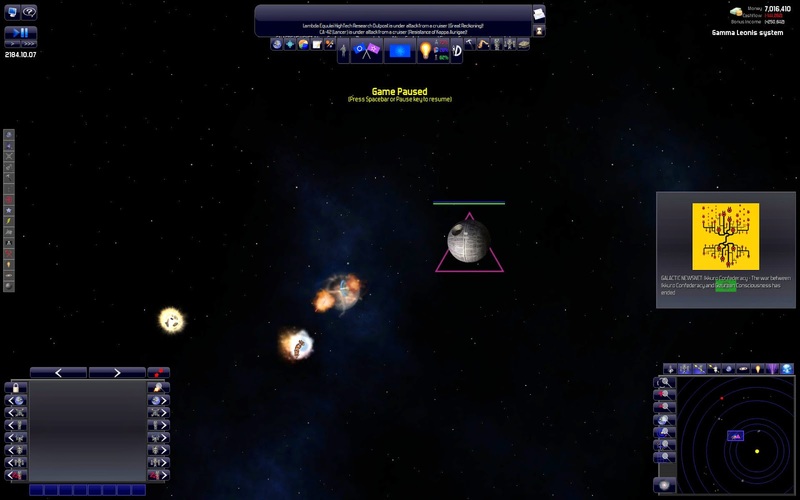 2181.01.11 The Kiadian spaceport is destroyed. The Olympian Freighter Celestial Aspiration witnesses the destruction. 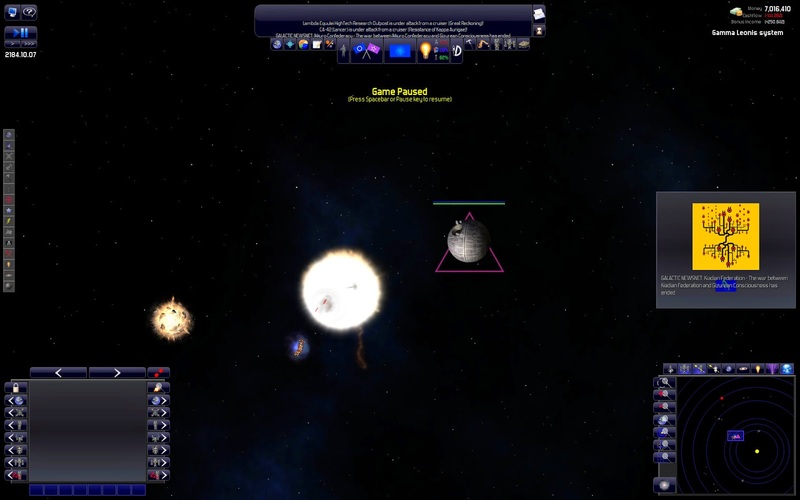 2181.07.06 2nd Fleet arrives at Kappa Aurigae 1. 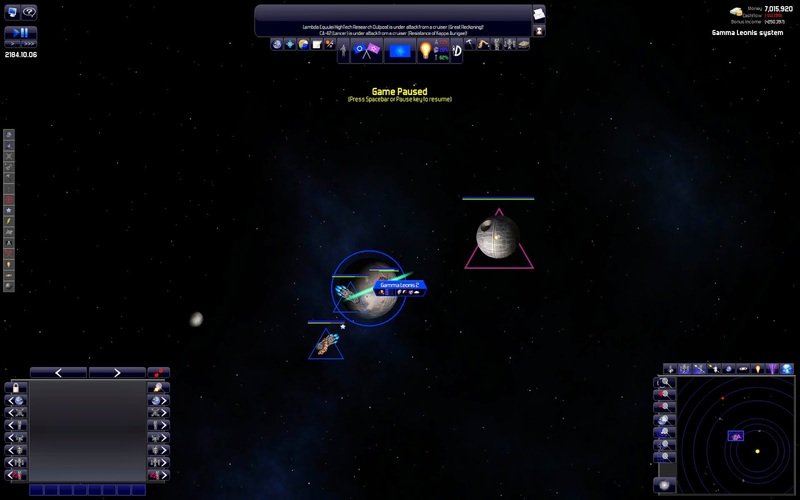 Five Eruktah vessels are in orbit. 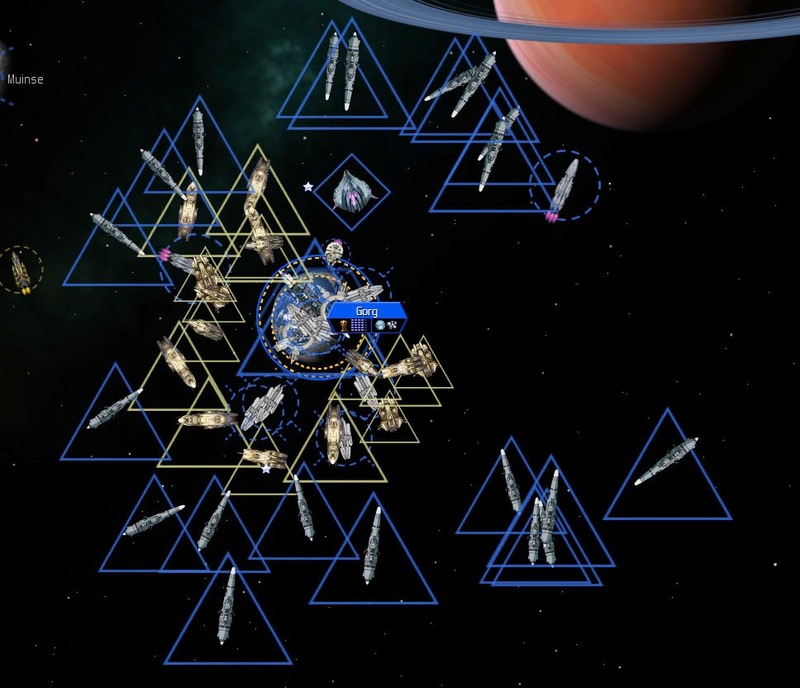 Fleet Admiral Nesalio resolves to defend any Kiadian vessels that arrive in the system. 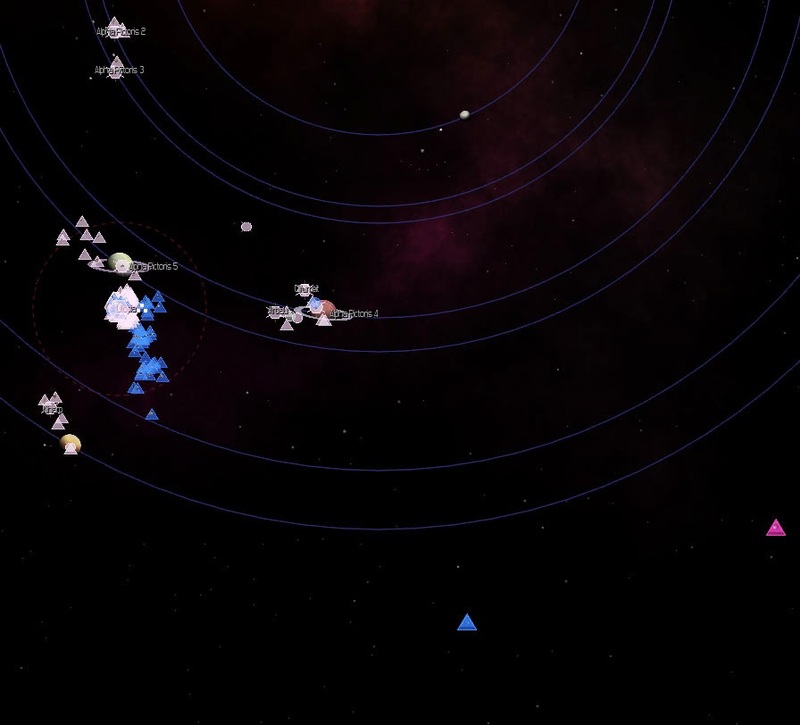 More Eruktah ships enter the system, as does a Kiadian Freighter. 2nd Fleet’s firepower is 3,006. 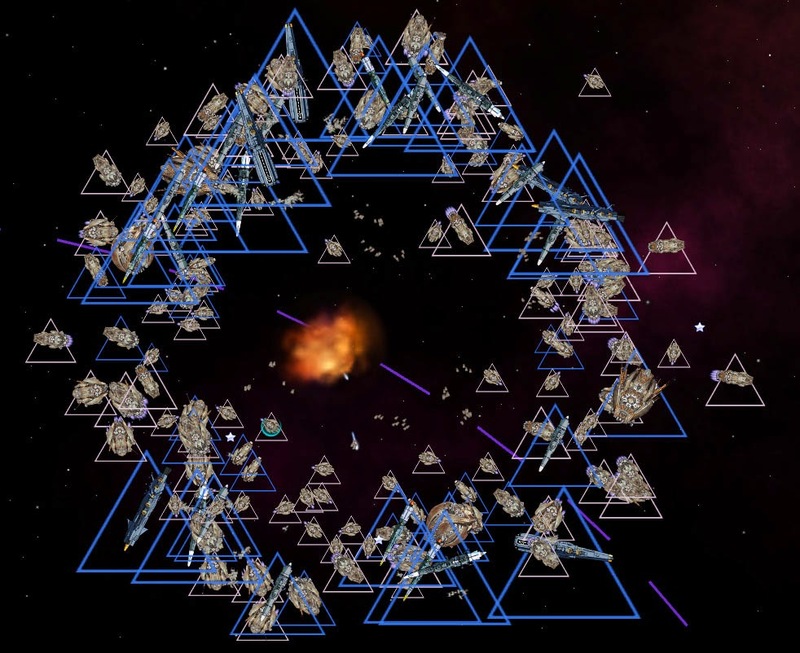 The Eruktah Fleet’s firepower totals 4,742. Admiral Nesalio worries that he might have bitten off more than he can chew. The Eruktah open fire on the Kiadian Freighter and destroy it in a single shot. Admiral Nesalio’s hand is forced. He opens fire. The Olympian destroyer Banished Trap, a recovered vessel, is the first to be destroyed. 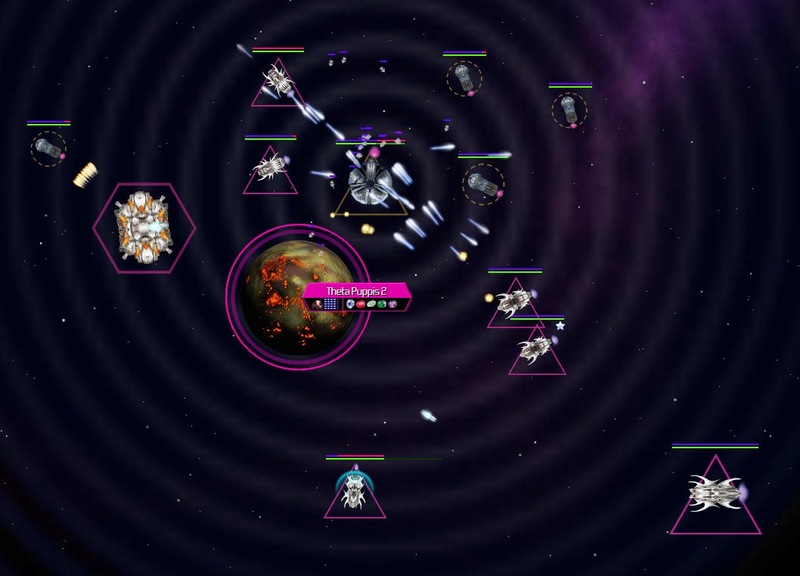 2nd Fleet’s flagship, the cruiser Pugnator, is the next to fall. Then the frigates Orion, Ara, Crater, Pyxis, Pegasus, Scorpius, Canis Major, Sculptor, and Auriga. Admiral Nesalio is killed. 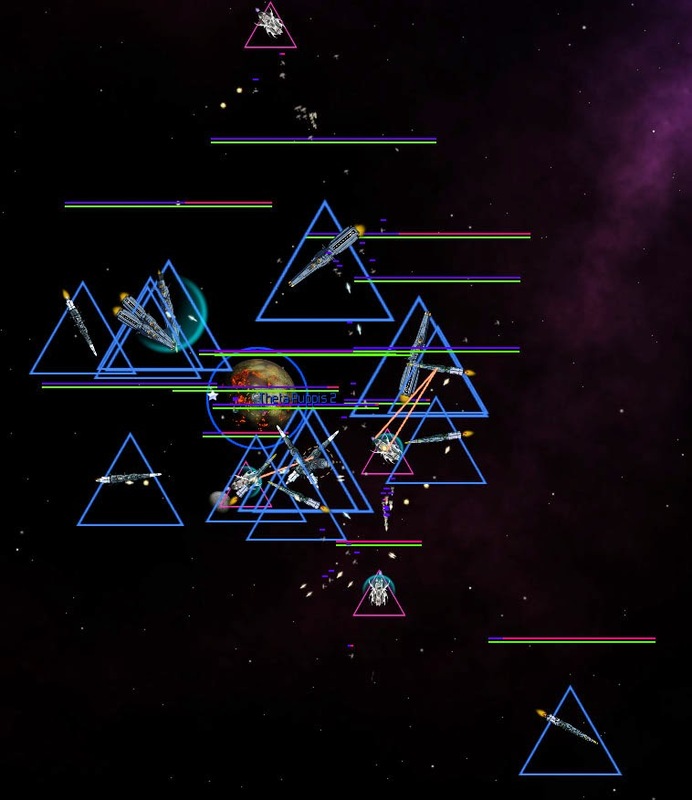 The surviving ships attempt to flee. The recovered destroyer Belligerent Liberty explodes, as does Sagitta and Pictor, before they can escape. 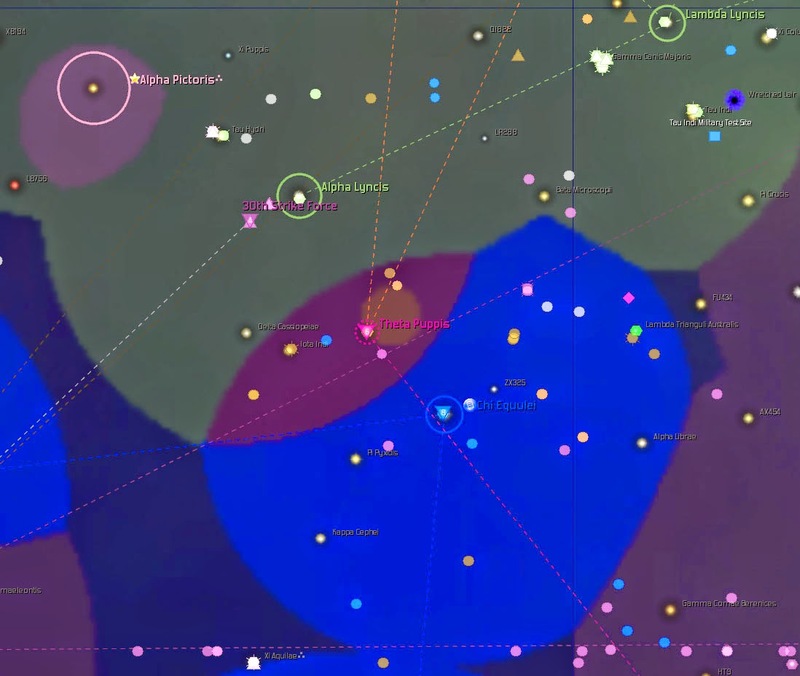 The remaining ships retreat to Ozevolfe in the the Omega Ursae Majoris system to repair and refuel. The Battle of Kappa Aurigae 1 is a wakeup call. The Navy, which has for years remained relatively stagnant, needs newer and more advanced ships, and lots of them. More Intrepid-class carriers are ordered, and a new vessel, the Olympia-class battleship is designed and many are ordered. 2181.08.24 The Eruktah Refugees warn Olympia to stop its military attacks. Olympia will refrain from attacking, for now. 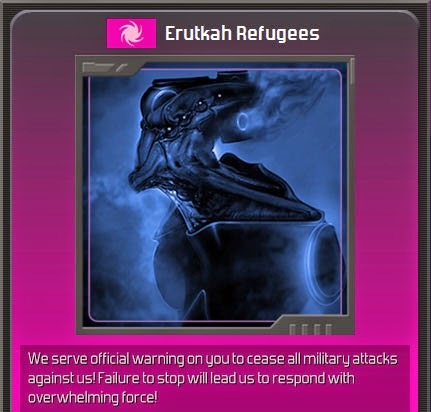 2183.01.01 The Eruktah Refugees now have the largest economy in the galaxy, despite having a mere four colonies. This is no longer serious, this is scary. 2183.05.06 The Eruktah Refugees are attacking forces belonging to the Quameno Ascendency, and have also apparently conquered Theta Puppis 2. This would be alarming enough on its own, but Theta Puppis 2 is on the Olympian borders. This cannot stand. 14th Fleet, consisting of four ships, is sent to Dark Horse in the Chi Equulei system to rendezvous with 1st Fleet. Once they rendezvous, they will attack. In the meantime 20th Fleet will load troops at Dark Horse. 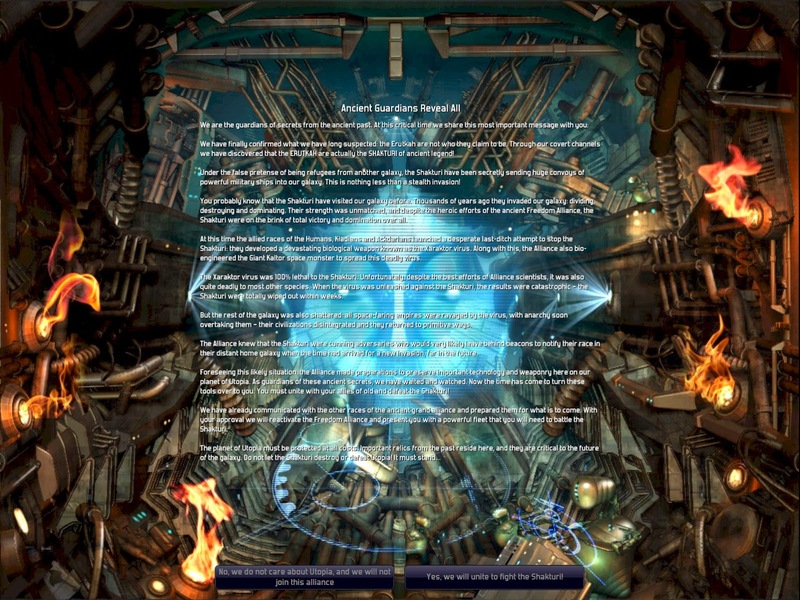 2183.06.24 The Ancient Guardians contact Olympia with a secret warning. This must be important. Of course Olympia will join the Freedom Alliance. 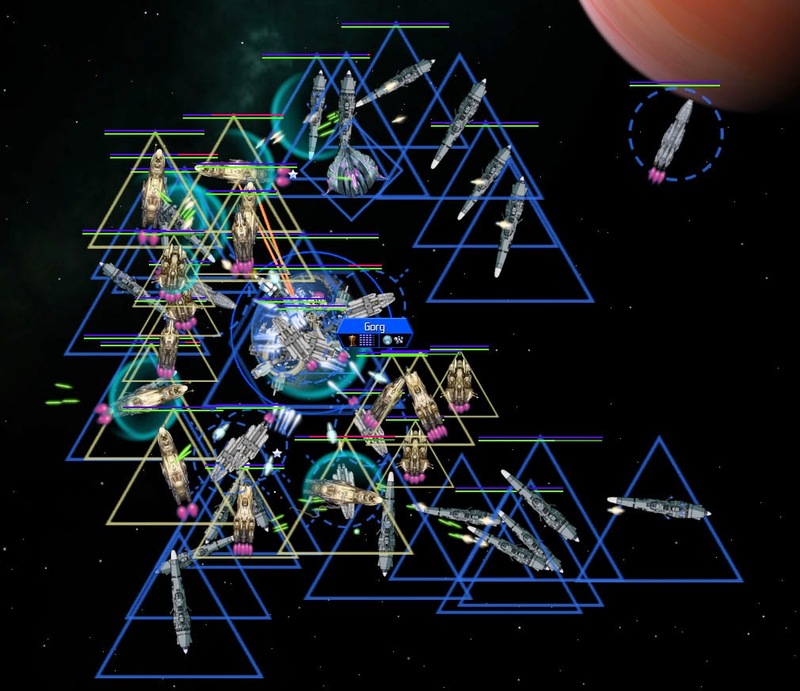 The Guardian Fleet consists of 34 ships with a firepower of 8,192, nearly equal in strength to the largest Olympian Fleet (21st Fleet, the anti-pirate force, consisting entirely of recovered ships with a total firepower of 9,746. Olympia welcomes the addition. 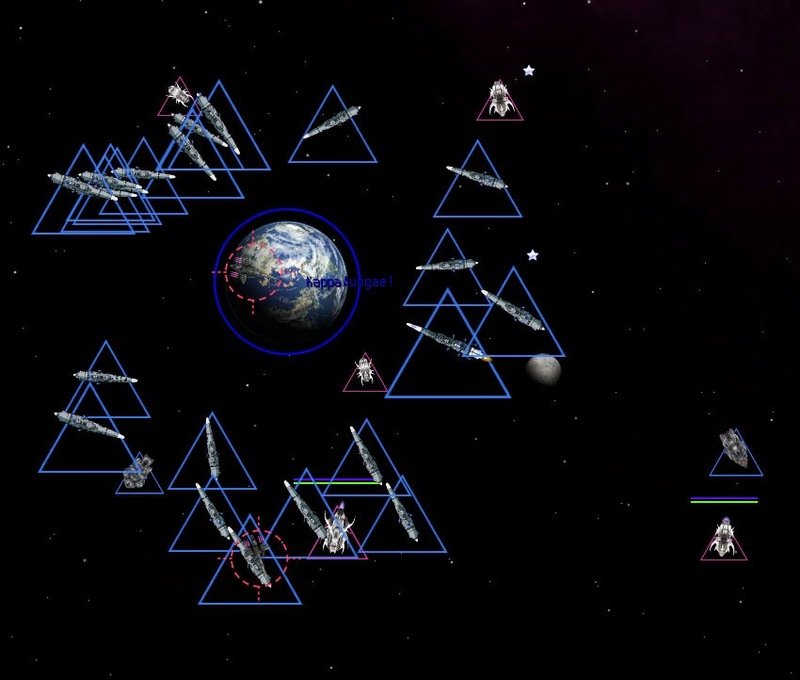 Elements of 1st and 14th Fleets arrive in the Theta Puppis 2 system. Theta Puppis 2 falls quickly to the Olympians. 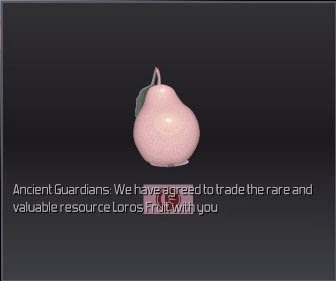 Nearby, it is clear that the Ancient Guardians are on the move. 14th Fleet disbands and joins 1st Fleet. 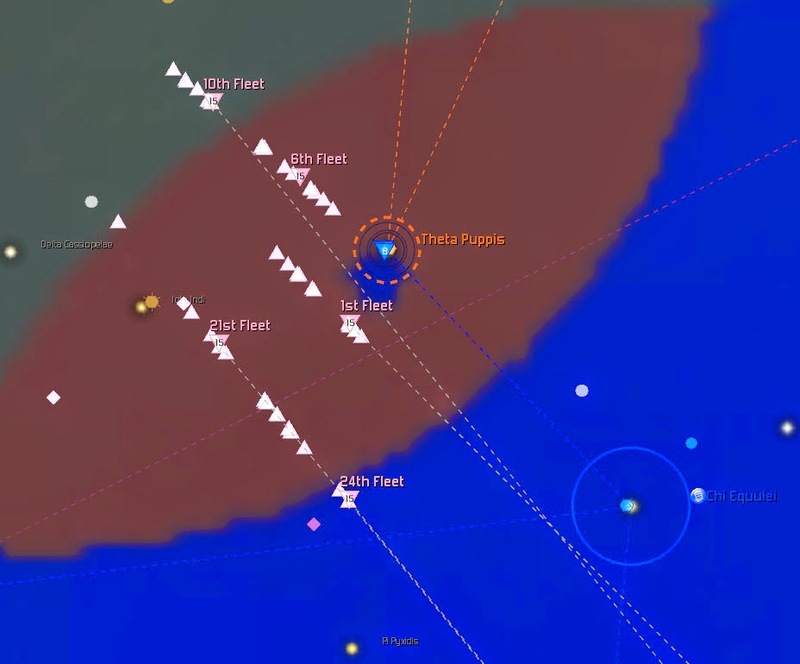 The Eruktah 17th Strike Force attacks Theta Puppis 2, and 1st Fleet responds. 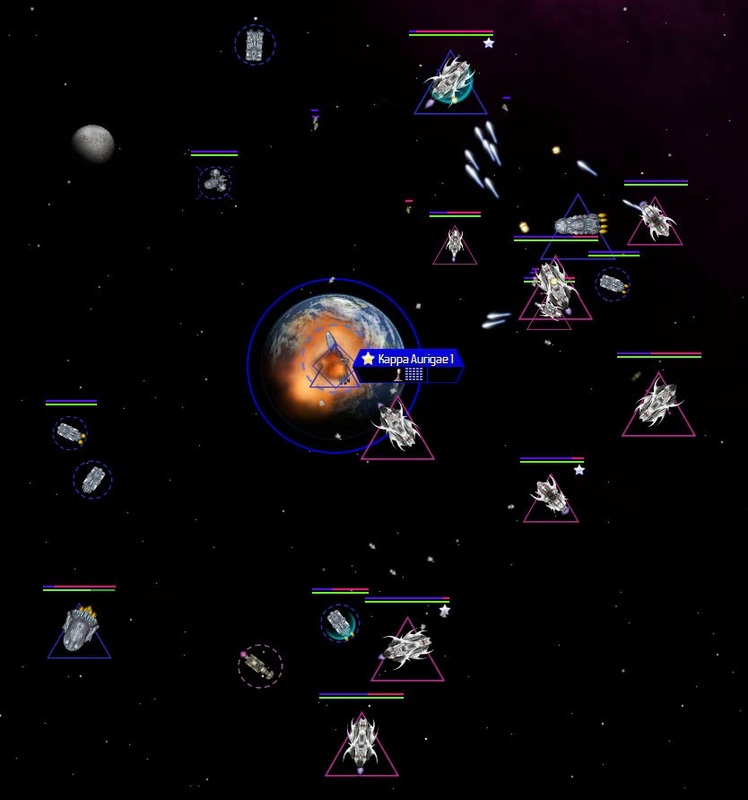 1st Fleet has been holding its own against the Shakturi Strike Force, and the Shakturi flee, for the moment. Unfortunately not a single ship was destroyed. 2183.12.02 It has been noted by Olympian battle tacticians that the Shakturi vessels have so far been able to escape the Olympian Navy without loss. Therefore the Perceptor-class Command and Control ship is designed, armed with a HyperDeny GW4000 and several Ion Cannons. 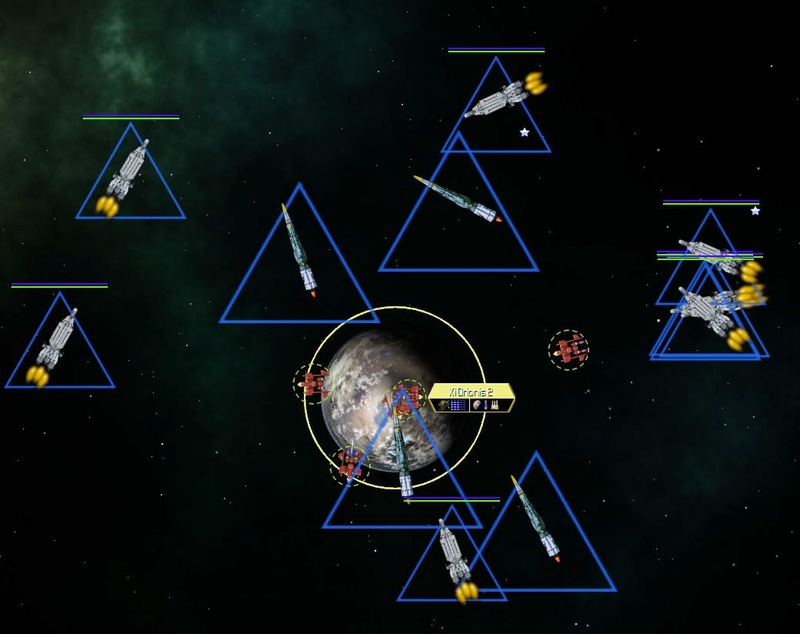 Other ships in the fleet exist that have these components, but this ship will be dedicated to it, freeing the other ships to be more pure combat oriented. 2184.01.05 Way to go, Dak! 2184.03.07 A pair of Shakturi vessels attack 2nd Fleet at Omega Ursae Majoris 2, and come to regret their decision. 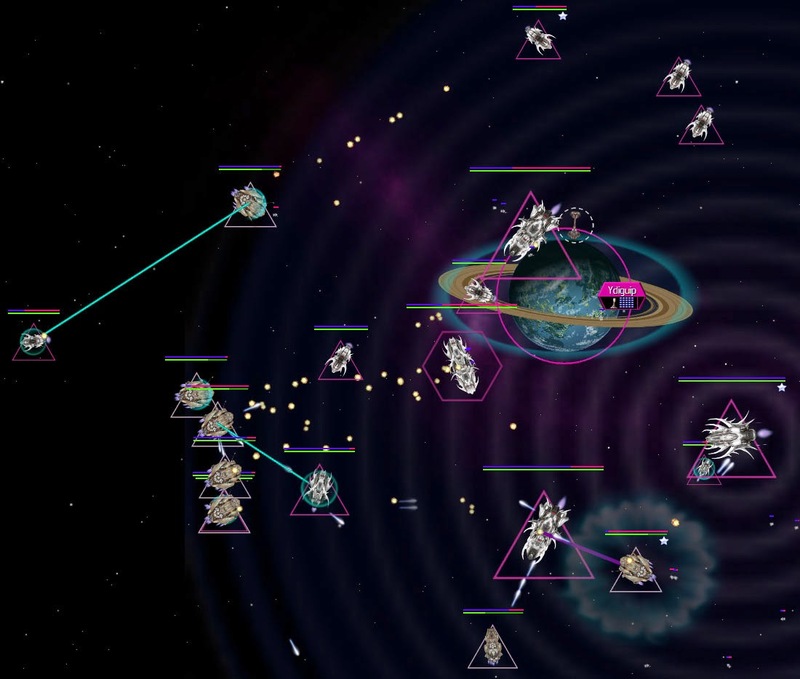 The Ancient Guardians have thrown their fleet into the fray against the Shakturi, and seem to be doing very well for themselves. 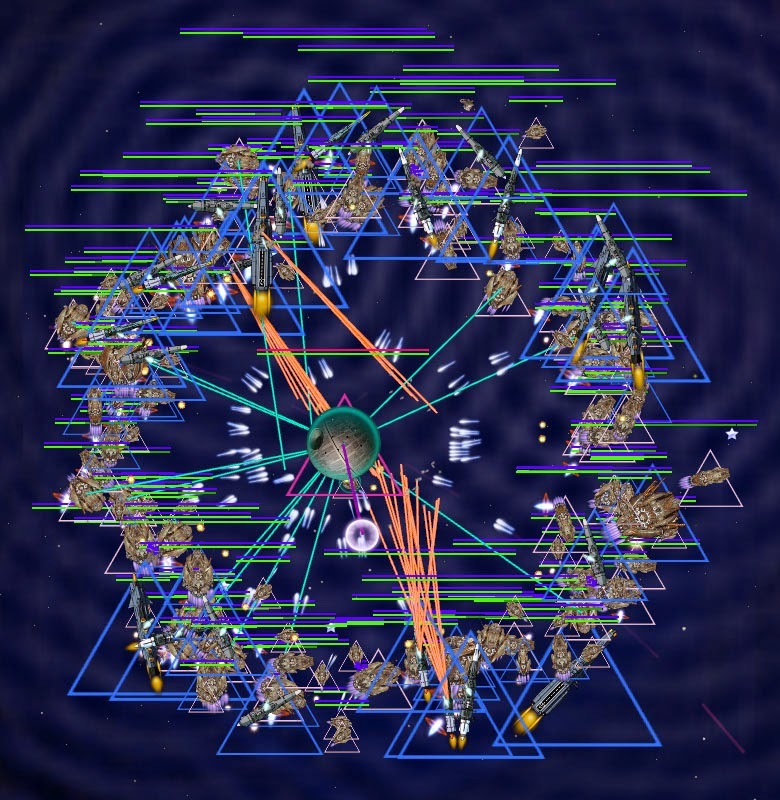 There are those in the Senate who believe that the Olympian fleets should hold back and let the Guardians take on the Shakturi by themselves, arguing that the Guardians can handle it. The Navy, meanwhile, organizes it new fleets and prepares to assist. 2184.04.24 What’s this? The Wekkarus, who for the most part have been relatively benign, attack the Ancient Guardians, who now request Olympia for aid. Olympia will respond, and put diplomatic pressure upon the Wekkarus to stop this madness. Unfortunately a cascade of war declarations occur, and Olympia finds itself at war with more than a dozen empires, many of them erstwhile allies. 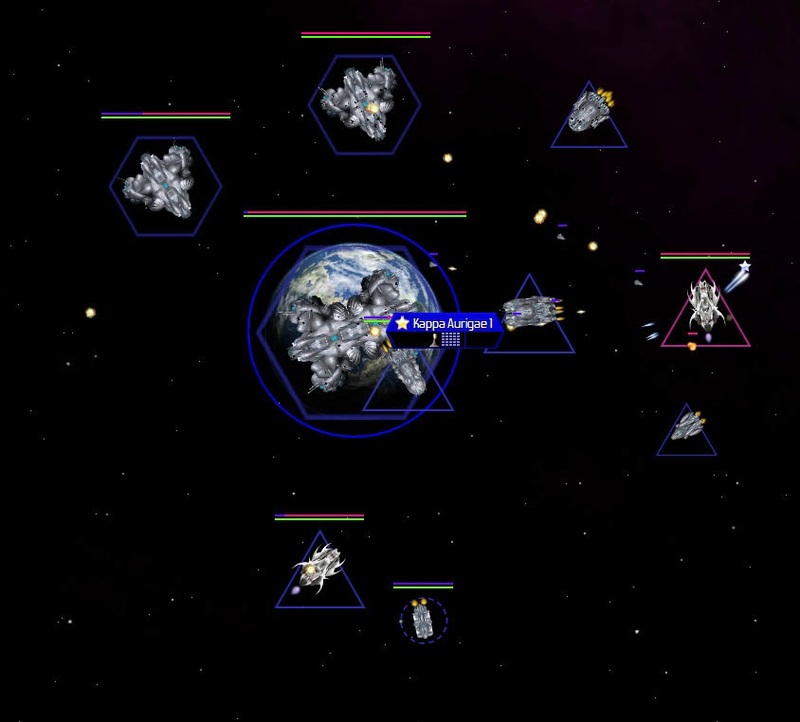 This is not the time for the galaxy to fight against itself when there are more important enemies! 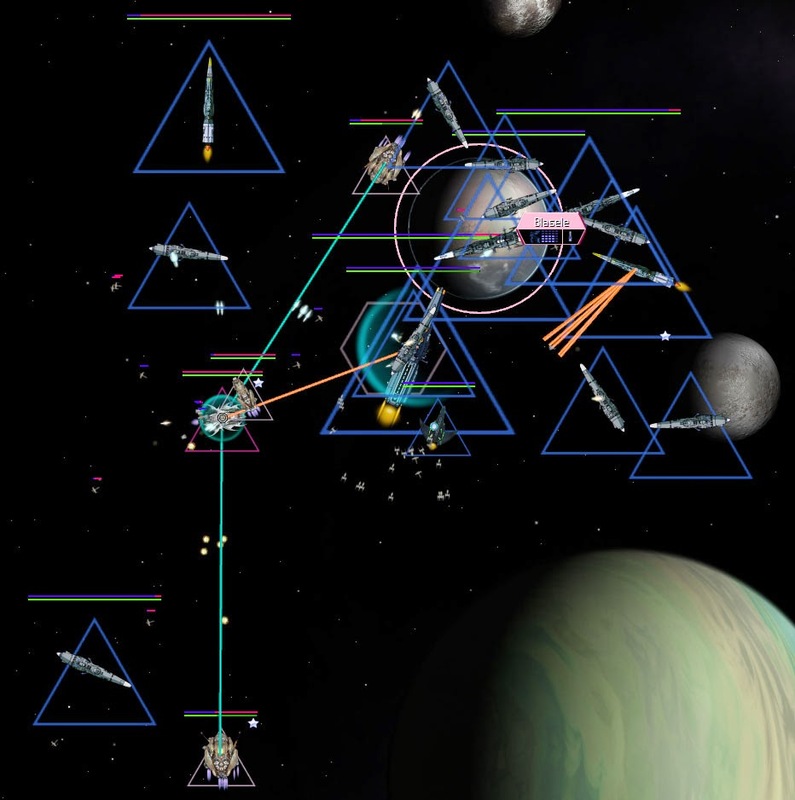 Rebellions occur at two colonies, Zeta Telescopii 3 and Elpoapet. Fortunately, the World Destroyer has a long way to go. 16th Fleet is tasked to intercept. 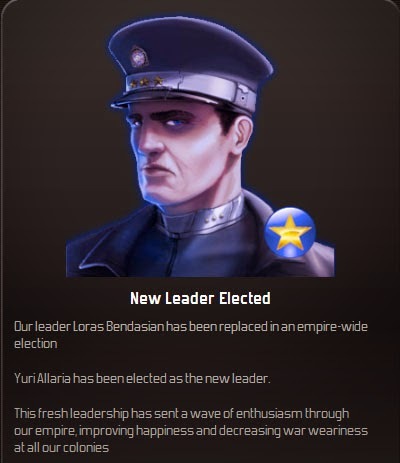 2184.07.10 Yuri Allaria is elected to replace President Bendasian. In the wake of the election, the diplomats manage to conclude wars with 7 of the 15 empires. Hopefully this will lead to a cascade of peace--so the galaxy and focus on attacking the Shakturi! 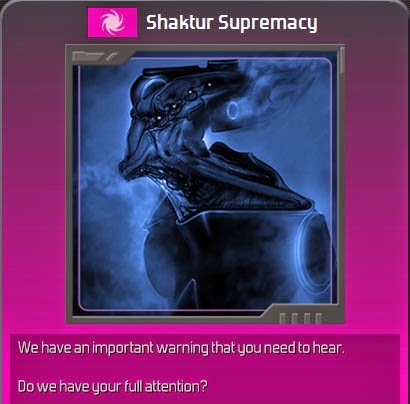 In studying the strategic map, Intelligence has discovered that the Shakturi have two World Destroyers: The Death of Worlds, and the Revenge of Shaktur. This is very bad news. 2184.08.01 The colony of Irmejuha secedes from the Olympian Way. 2184.08.08 The colony of Ordo secedes from the Olympian Way. 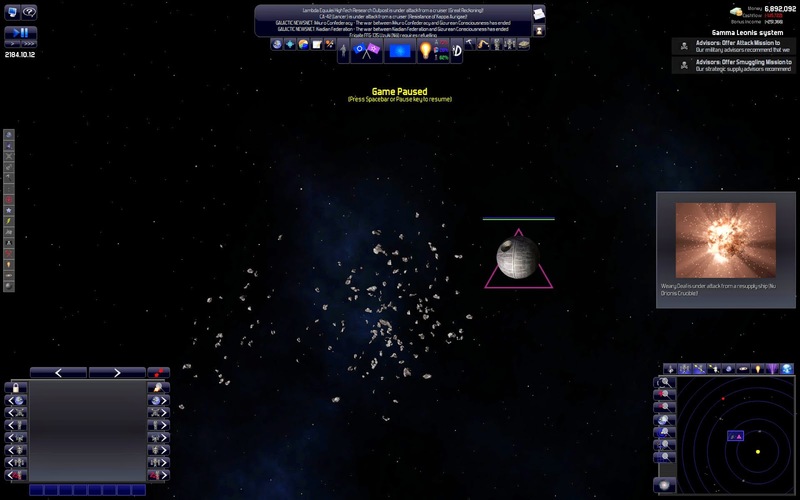 2184.09.05 Lead elements of 17th Fleet arrive in the Blasele system, which has served as a forward base for the Ancient Guardians, but swarming with Shakturi in orbit. The missile frigate Kusunoki comes under heavy fire as soon as it arrives and is swiftly destroyed. The destroyer Aurora is destroyed next. 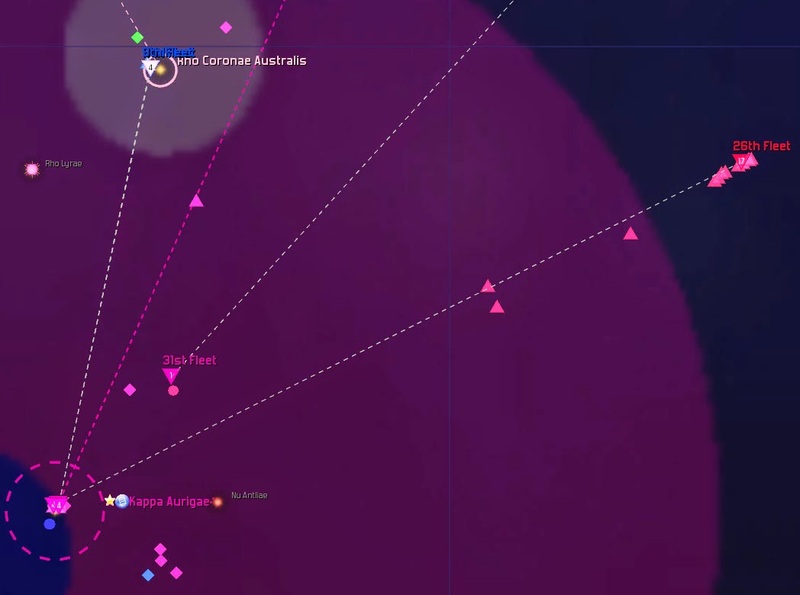 9th Fleet and 17th Fleet converge on Blasele, while 2nd Fleet heads toward the Kappa Aurigae system. 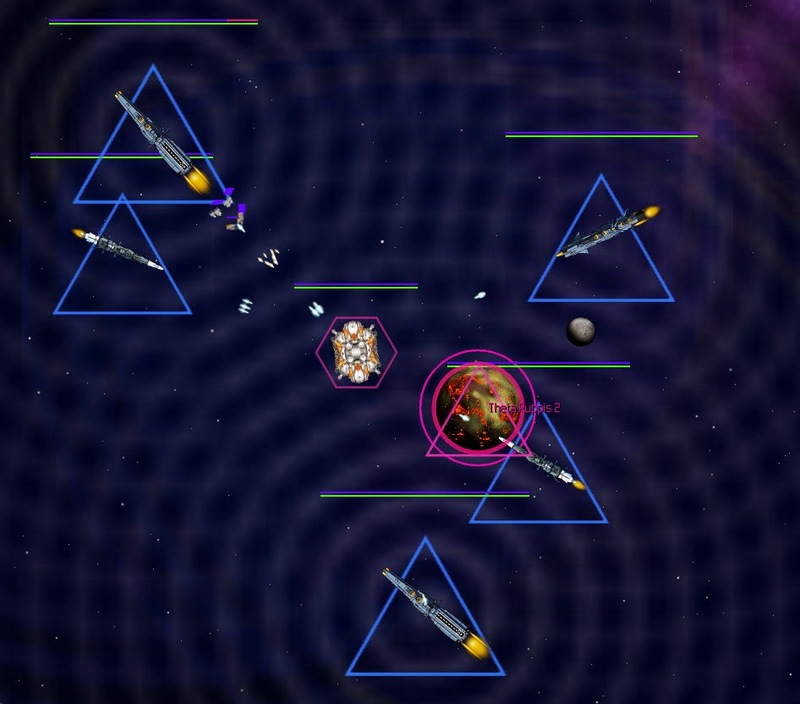 Ancient Guardian ships arrive at Blasele, and soon the remaining Shakturi flee. 9th and 17th Fleet will hold position, allowing the Ancient Guardians to expand their beachhead. 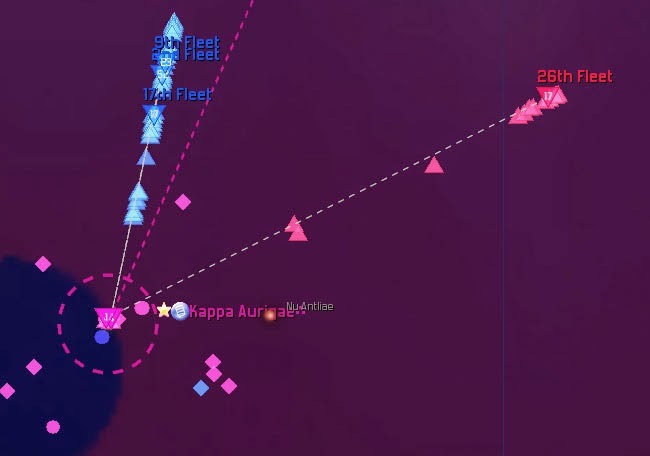 2nd Fleet continues on to Kappa Aurigae. 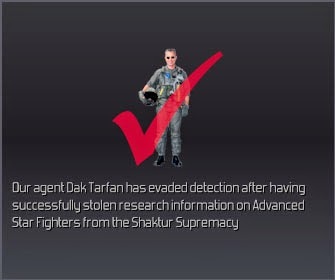 A third Shakturi World Destroyer is discovered, the Dark Reaper. It is discovered just as it enters the Gamma Leonis 2 system, owned by the Enton Coalition. Forty million Teekan voices cry out in terror, and are suddenly silenced. The battle at Blasele rages. 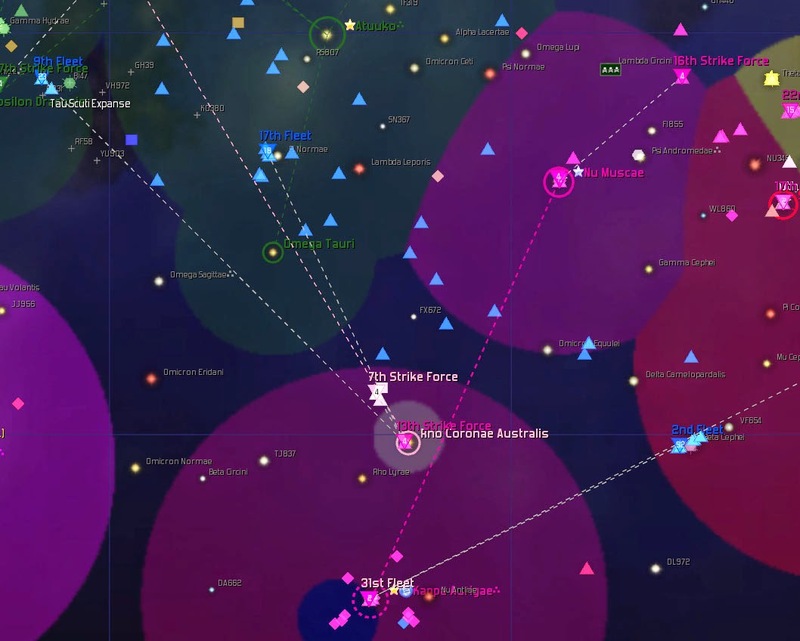 2nd Fleet is diverted there, out of fear that it may bite off more than it can chew if it goes into the Kappa Aurigae system. 2184.11.20 Reason begins to break out, as various empires agree to end their wars. But the World Destroyer Death of Worlds closes in on Utopia fast. Death of Worlds closes in. 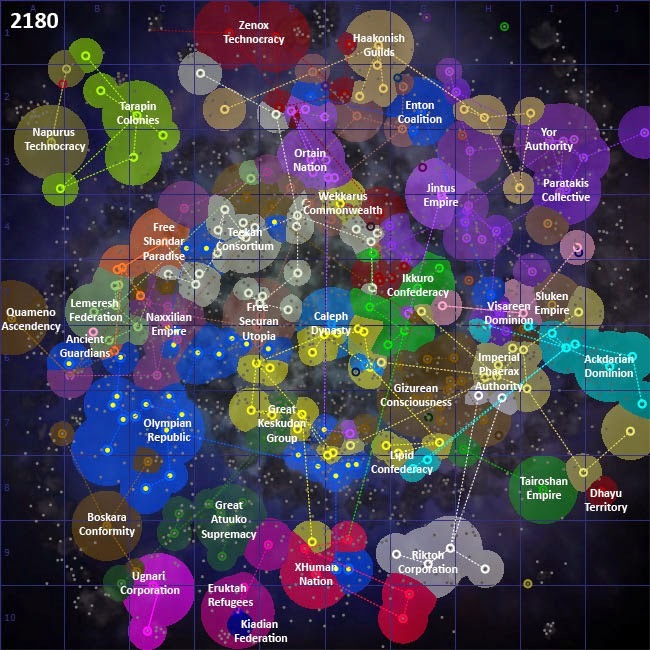 Death of Worlds arrives in the Utopia system. All Olympian ships in the vicinity, all 87 of them, totally 23,473 firepower, are ordered to attack. 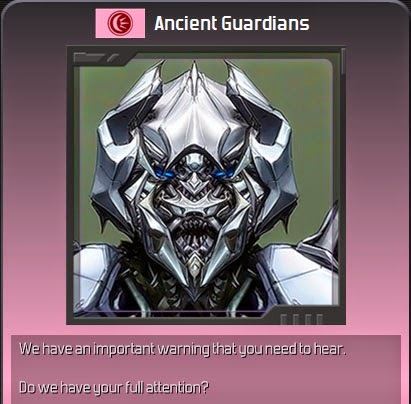 The Ancient Guardians arrive first and open fire. The Death of Worlds uses its superlaser on one of the Guardian vessels, destroying it instantly, but this is good since it will have to recharge. 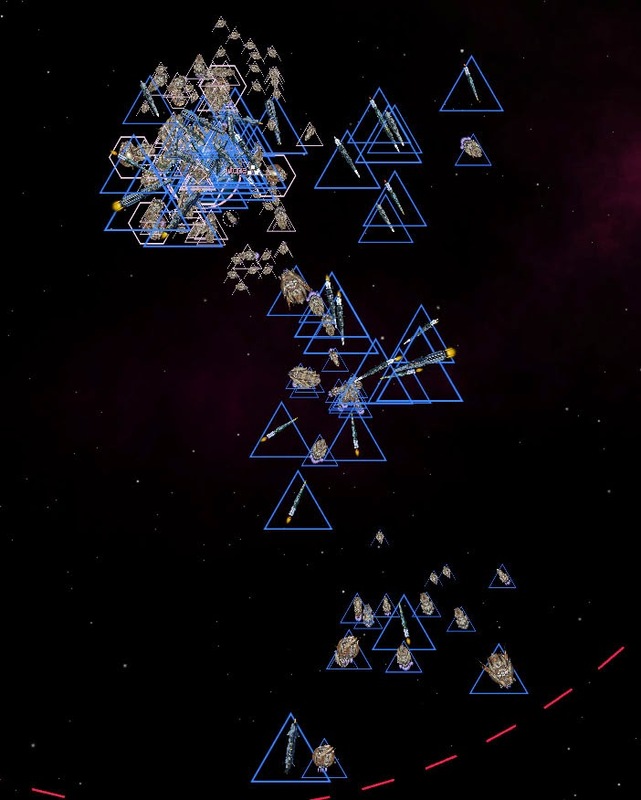 The amount of firepower dumped onto Death of Worlds is incredible. In the meantime, 2nd Fleet has arrived at Blasele. 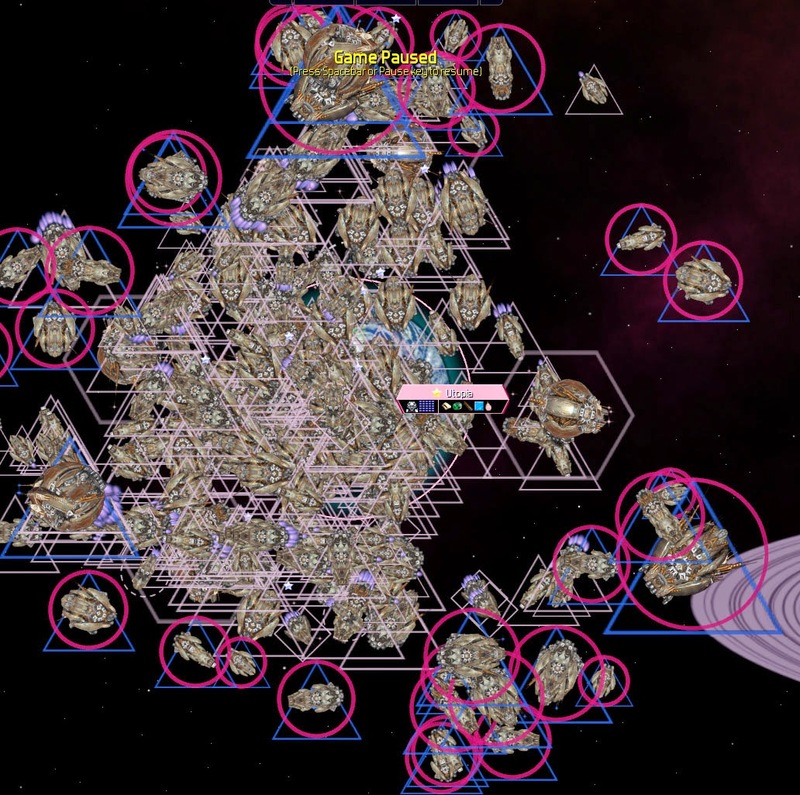 The XHumans have sent their 26th Fleet on an attack vector to Kappa Aurigae. Now is a good time to strike. The order is given, 2nd, 9th, and 17th Fleet are ordered to leave Blasele and attack Ohozruluvo, the homeworld of the Shakturi. As the year comes to a close, the fleets close in on Ohozruluvo.